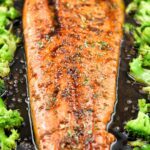 While in the search for tasty but healthy dinner ideas, this Sheet Pan Honey Balsamic Steelhead Trout recipe was the perfect choice. By blending the slightly tart yet sweet flavors from the sauce with garlic, you can turn a good piece of Steelhead Trout into something great. You can also mix the broccoli in the sauce to give it a boost as well. There are a lot of benefits to eating this type of fish but the most important one for this dinner recipe will be the taste. 1. Begin by adding 2 tbsp of butter to a cooking pan and cook broccoli florets for 10 minutes on medium heat, covered. 2. Add non-stick spray or butter to large baking tray. 3. 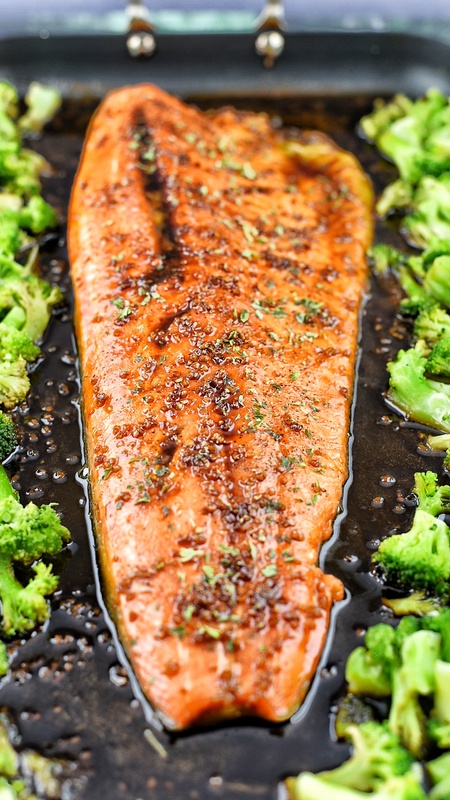 Place the entire Steelhead Trout filet on the baking tray and season with sea salt, black pepper and creole seasoning. 4. Pre-heat cooking pan to medium/low heat then add 3 tbsp of butter and allow it to melt. 5. Add honey, balsamic vinegar, lemon juice, white cooking wine, brown sugar and minced garlic to pan. Cook for 5 minutes on lower heat, then slightly increase heat and cook until it begins to bind. 6. Once complete, pour balsamic mixture over the entire Steelhead Trout filet. 7. Add oregano over the fish and place the cooked broccoli on the sides of the baking tray. 8. Pre-heat oven to 375 degrees and cook ingredients for 10 minutes. 9. Sprinkle parsley if desired, then serve. I will be trying this recipe for sure. My husband always go out to fish trout and this sauce will be on my list. Thank you so much for sharing. Shobee I think this sauce is great with trout. Please let me know how it comes out. Thanks! This looks so amazing! And Im not typically a fish person, so that’s saying something!!! Wow thank you Kelly! I appreciate it. Thanks so much I appreciate it! This trout looks perfect! I’ve been trying to cook fish more lately, and trying to branch out to different types of fish that I don’t normally buy. Trout is going to be next on my list and I am going to try this recipe! It looks so so good. This trout has turned out so delicious! I’m literally drooling looking at the pics. I haven’t cooked trout at home before, but now I totally need to try it! 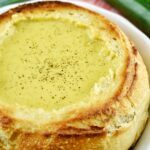 This looks delicious, and the broccoli is the perfect accompaniment! Oh wow! wonderful clicks, totally drooling over pics! I am a seafood lover and this is perfect for my family. This looks delicious! My husband and I are always trying to work more fish into our diets, but we’re not really into plain fish dishes. This looks like something we’d both love! Can’t wait to give it a try! I love trout and this preparation looks amazing. I can’t wait to make it! This recipe is seriously making me hungry!! I love the flavours that you have used. Will be making this for sure! This looks super flavorful and so delicious. I love the addition of white vine in this one. We love fish and we have it like every friday. Can’t wait to give this a go.